A few images illustrating a system we pioneered to effect the repair of leaking concrete ponds using tailored liners. We also use tailored liners to eliminate unsightly folds in new ponds. Liner can be tailored to fit any shape. Defunct	concrete pond - Perfect for restoration. More on this pond (and others) in this gallery - scroll down to follow the restoration process. This leaking concrete pond is called "The Tank" and was built by Miss Gertrude Jekyll in her own garden. An important feature to rehabilitate. Here is The Tank cleaned out. The fish have been put in a stock tank for the duration of the works. The Tank, Miss Gertrude Jekyll's pond, relined with a tailored liner and ready for rendering. The Tank relined and rendered. Next step, removal of the lime from the render before reintroduction of the fish. The Tank relined and rendered to reinstate the concrete pond look that Miss Gertrude Jekyll had in mind when she designed this pond for her own garden. Another leaking concrete pond repaired with a tailored butyl liner. This is one of the first tailored liners we designed and fitted, We think around 1990 - hence the grainy image scanned from an old photograph. 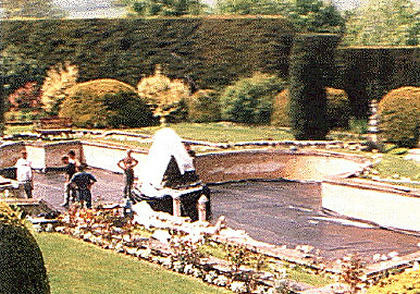 In this case the liner had to be fitted over and around the central fountain feature. Another leaking concrete pond. This time it is a Koi pond. These Koi were housed in stock tanks for the duration of the works on their "home"
Cleaned out leaking Koi pond. Provided that the rim slabs are sound, there is no need for their removal to reline the pond. 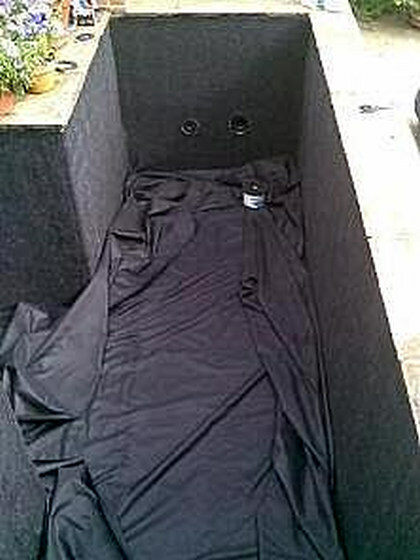 The tailored liner laid out in the base of the pond. Decaying concrete repaired. Liner in place ready for rendering. Rim slabs being replaced on new rim foundations. Another view of a relined leaking concrete pond. Pond relined, rendered, filled and planted with lilies. Another leaking concrete pond. This one we repaired using a tailored liner. Heavy duty tailored liner being fabricated in situ. Tailored liners can be made for non rectilinear structures too. 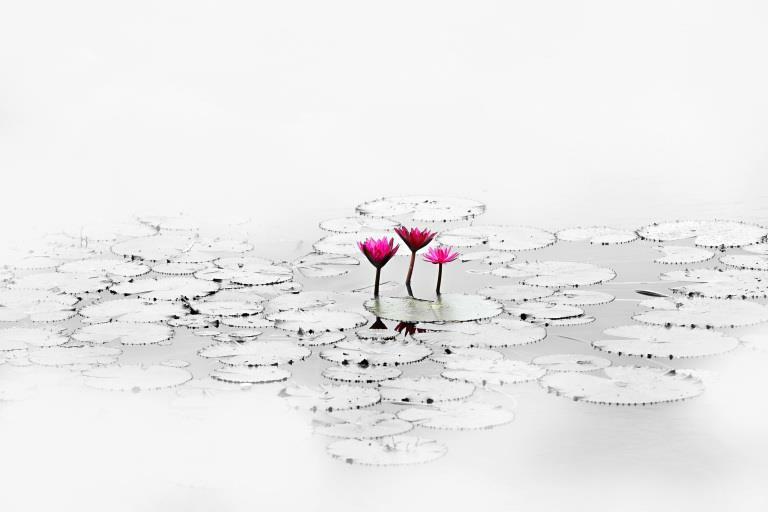 Established in 1980 and working exclusively in the grounds and gardens of private clients on natural and man-made ponds, lakes, water gardens, streams, water features and attendant landscapes, we relish all aspects of Water Gardening. Our pond construction, maintenance and planting teams routinely operate in Surrey, West Sussex and Hampshire in an area bounded by around fifty minutes travelling time from our base at Hindhead GU26 and almost never inside the M25 orbital motorway. An intriguing, historically interesting or challenging project may tempt us further afield! 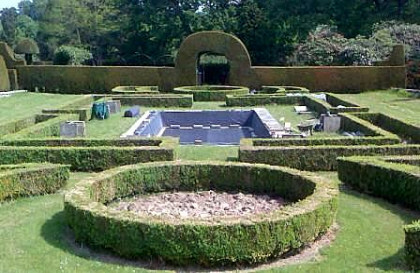 Naiad Pond Services is a small (even microscopic) business offering a very personal and bespoke set of specialist pond, lake and water garden services. Address: PO Box 259, HINDHEAD.